Dining suite to accommodate up to ten people. 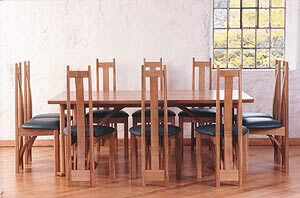 Made from figured Oak, Ebony with leather upholstery. Laminated arches, facets and gentle curves all feature strongly within this design.